Truth by Kbaig: Veil of Secularism… How long can save India from disintegration? Veil of Secularism… How long can save India from disintegration? Through effective propaganda defame Pak-army on international and local level and misguide people of Pakistan to hate army. To conduct such acts of terrorism on broad basis within Pakistan so that Pak-army and ISI gets busy in the internal fight. RAW was given free hand in planning, and expenses to act upon such acts. The above disclosure is by the leader of lower castes Dr. Kancha. Dr. Kancha said, "in order to make India a superpower, smallest portion of population 'Brahmans' who have control of Indian govt. have adopted the same policy to its neighbors as they have for lower castes and minorities within the country since 1947". He said, "New Delhi has 126 billion US dollars to buy modern fighter jets but nothing to improve the condition of its poor minorities". Dr. Kancha made an appeal to Indian Muslims to support them for freedom. Dr. Kancha gave that statement as a reaction to 30th march 2010, report by a BBC's correspondent Chris Morris, "India's Security Nightmares: Naxalites, Kashmir, 7 Sisters & Communalism". As usual Indian media didn't react to this report in order to decrease its affects. But after the deadly attacks on Indian police n army, it is impossible for Indian media to ignore the dispersion within India. So a long series of questions starts about the integrity of India. Few days ago in Jharkhand Mao freedom fighters attacked police line, killed 66 policemen and disappeared in the darkness of night. The number of injured is 21 in that attack few of them are critically injured. However Indian media only reported 26 deaths and no causalities. This is not the first time, before that many police n armed forces personnel have been killed by Mao or Naxal fighters. According to Indian govt. stats. in 2004 Naxal separatists killed 1639 personnel of police n paramilitary forces. (The innocent citizen's causalities are not included who were killed in those attacks). In 2005 security forces have to take up 1803 dead bodies. 2006 was a peaceful year 263 policemen were killed. In 2007 the number of deaths was above two thousand, even in Chhattisgarh 139 dead bodies were left to wild birds n animals for 3 weeks. But due to the fear of Mao fighter no one dared to bury those dead bodies. Separatists done that attack when security personnel who were in Hyderabad to safeguard visit of American President Bush were called to Hyderabad from different provinces. After Mr. Bush left Hyderabad the security personnel were returning back, when the Mao fighters ambushed the convoy and killed all of them. Before leaving they took the weapons, uniforms, boots even underwear’s of the dead policemen. On that incident defense critic of India, Nahar Naik criticized Indian govt. in his essay "growing Naxalism in India". That article was rejected by Indian newspapers for publication. However in Jan. 2008, www.tehleka.com dared to publish it in its website so that the India can be unveiled. 20th November 2007, in the state of Andhra Pradesh, distt. Chandoli saw such an act of separatists attacks on police head quarters which has no 2nd example even in Congo, Rwanda or Burundi where is total lawlessness. At midnight freedom fighters attacked headquarters and killed 135 people, occupied for two weeks. In that headquarters separatists formed "Peoples War Group" which includes apart from Naxal fighter many lower class peoples. After wards the head quarter of PWG was shifted to the jungles of Hyderabad Dakin, which is still active. In order to tackle that attack state police ordered personnel from other districts, but these personnel applied for holidays. At least police was sent in the APCs of professional constabulary, but Naxal separatists had evacuated the headquarter before police arrived. 2008 in Mizoram, Manipur, asaam fighters kidnapped 263 security personnel’s and after trial in fighters self made courts these personnel were hanged to death. Blaming Pakistan for interruption in Occupied Kashmir; blaming Pak-China for helping freedom fighters in aasam(now Bangladesh is also included); and blaming china for helping Naxal freedom fighters. But report of Chris Morris shows that 55 percent of India is under control of separatists. According to report "Aronachal" which china claims to be its part, India is loosing control there. In spite of all the struggle, India is unable to stop the use of Chinese currency. 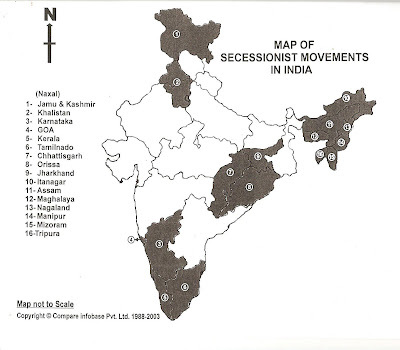 According to report there are 152 separatist movements struggling. In asam 37, minipur 41, meghala 14, nagaland 3, taripura 30, mezoram 2, aronachal pardesh 8, moreover Mao rebels have 9 groups, and Naxal rebels have 8 groups. All these groups are equipped with latest weapons. The report also includes names of groups such as 12 inactive groups of Punjab, and 19 groups in occupied Kashmir. 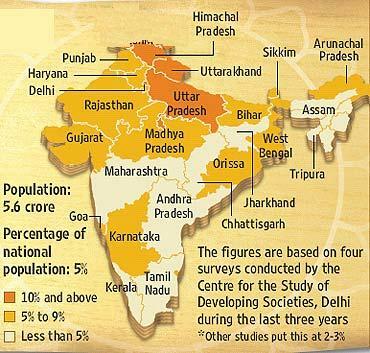 "What is happening in the provinces consisting of huge population of lower castes, neither secular Indian media has to do anything to it nor govt. is ready to leak out the news about acts of state terrorism to the outer world… Actually due to the armed freedom fighting groups activities life becomes totally stagnant. But the rulers of upper caste in new Delhi are not concerned by the people and the problems of these areas. The astonishing role of America n European human rights is that they know the truth about the India but they are silent on the state torture on millions of population from the coast of napalm to the Bengal bay. They have closed their eyes because america n Europe can’t accept the people of these areas getting related to communism n socialism? Coz the Brahman rulers of India know the weak points of America n Europe so they have continued their aggressive policies. This the result of such policies that including occupied Kashmir 16 states of India think themselves as slaves of India. Whether these are lower caste Hindus or minorities all are target of Brahmans torture. Struggling for their rights through peaceful talks for 60 years under Indian secularism, now these people have no way out but to get freedom from India." Dear readers, cunning enemy like India has done whatever damage it has to do our country under its aggressive plan of 2004. but in the mean while she has been unable stop the fire of deprivation. Now that fire has become a big hell. To the east of bay of Bengal southern Indian states, ureesa, Jharkhand, Chhattisgarh, south-east states Karnataka, Tamil land, and Kerala, moreover in the east of Bangladesh and Myanmar little but dense populated states like Nagaland, Manipur, Mizoram, and asaam are those areas which have been curtailed by ironic Brahman rule. If the world knows what is going upon the people living there, it will forget the tortures of Halaku. These states are like closed forts . the people living doesn’t accept themselves as Hindus. Nor they are ready to bow more in front of Hindu Brahmans of hamachal pardesh, utar Pradesh, and madhiyapardesh. This collision has created such a war within India which will end upon the freedom of all of the effected states of India, or disintegration of India. Within the Pakistan, the groups following India aren’t ready to give this fact importance more then hypothesis. They should read a book by an Anglo-Indian “Simon Angul” living in Britain, “ Caste system of India”. In which the writer proves the Indian econmy as fake, fraud and insult to humanity. Writer proves India the only liar state of world, where lower castes Hindus have worst life than a dog. According to writer India has 13 states rich with minerals, only ureesa has 46 percent of the whole India. However all of these treasures are owned by hindu brahmans and local population get their part in the shape of labor or lower jobs. 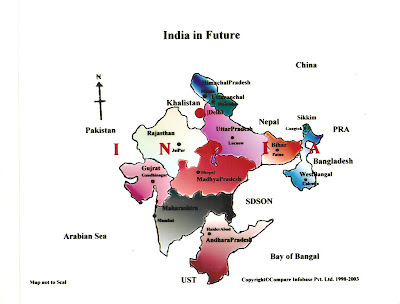 What will be the end of India in future? Its answer has been given by “institute of human rights in south asia” working in America, Europe and canada in its reports and “Camegis institute, Washington, USA” reports about the future of India. 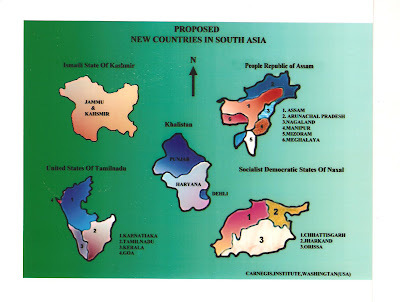 These reports show the future maps of India which our media hasn’t yet tried to bring to the public to the day. On the other hand many international defence crtics have the point of view that with the ferocity with which Mao and Naxal freedom fighters are working, it shows they have backup from American and british secret services and financial support. Published in Daily Nawa-i-Waqt on 10th July 2010.